This is the quilt I’m sleeping under on this trip. 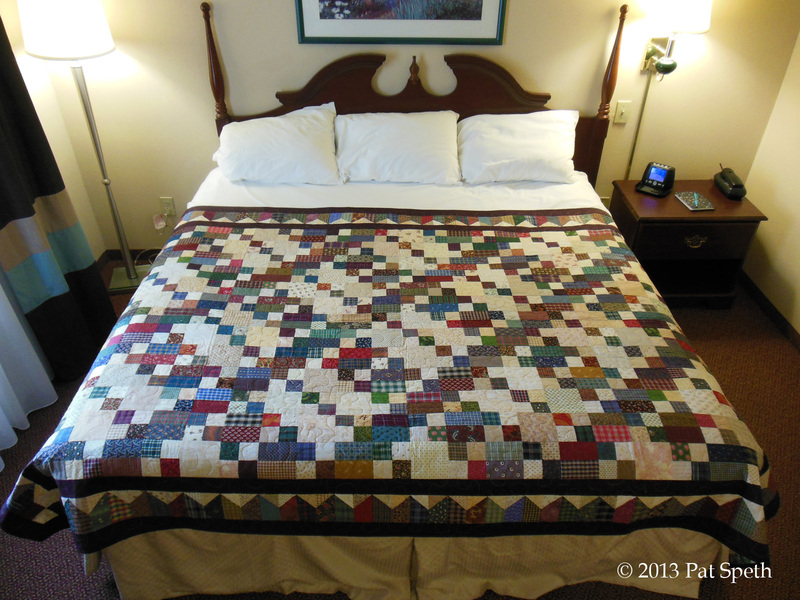 I can’t help but smile when I walk into the hotel room and see one of my quilts on the bed. 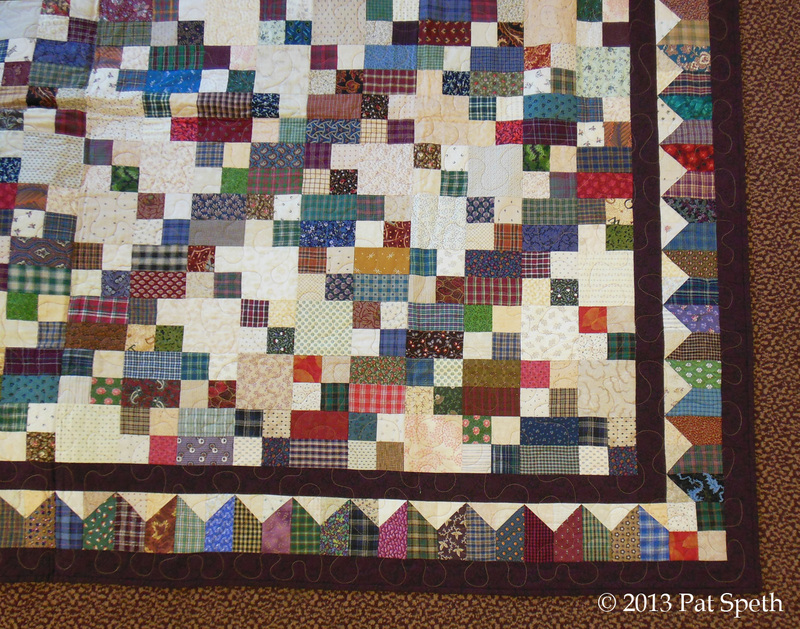 It’s the traditional Kansas Troubles block and I put a great pieced Nickel Border on it. 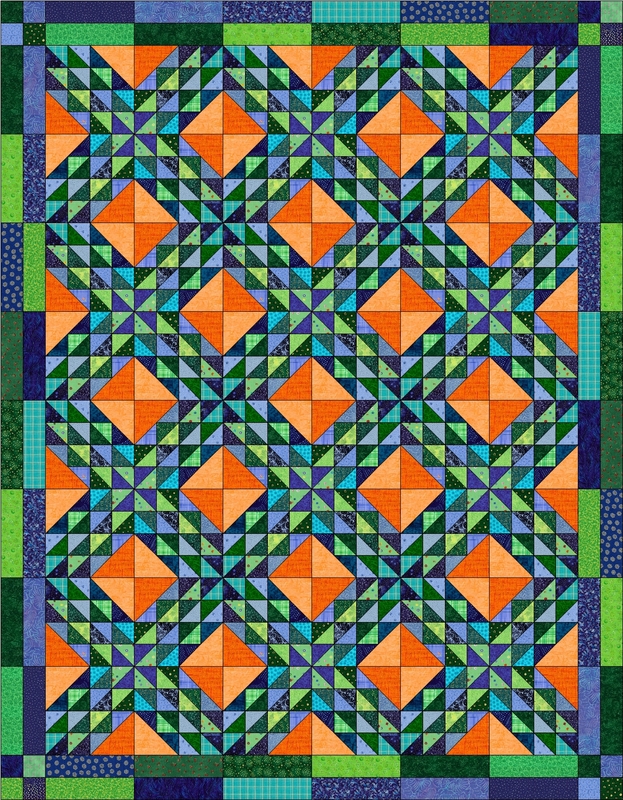 I don’t have this quilt in any of my books or published patterns; I don’t really consider it a Nickel Quilt. Having said that, this then is a good example for the fact that you can put a pieced Nickel Border on any quilt! 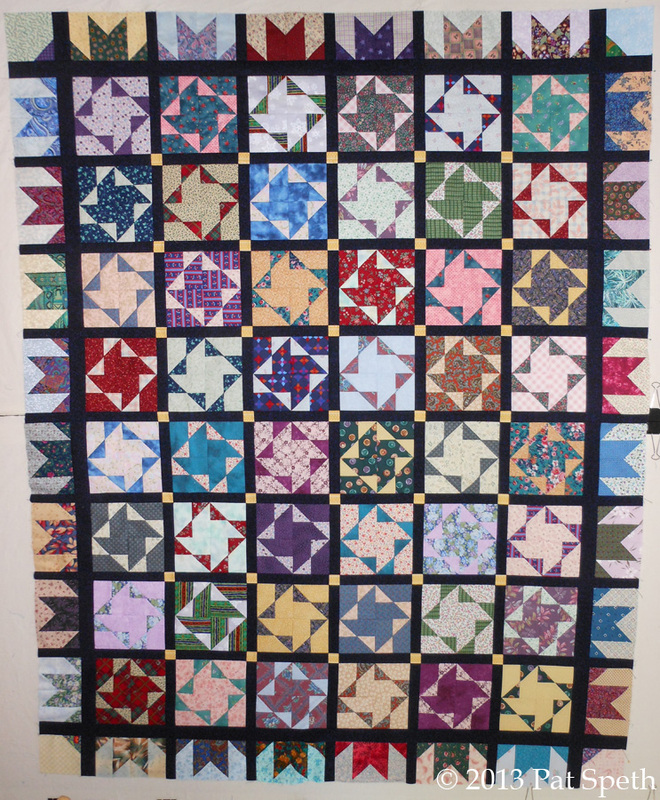 Below is a close-up of the piece border on this quilt. It’s made up of Picket Fence units; they have so many great design possibilities. 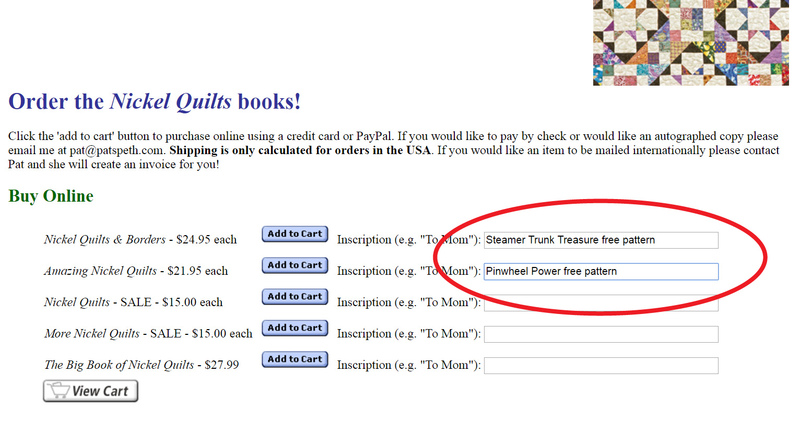 This border option and many more are in my Nickel Quilts & Borders book. I’m teaching my Pieced Borders workshop a couple of times on this trip and one thing I always like to point out in the class is that any time you make a pieced border that is directional, be sure to flip the border and see what it looks like pointing in the opposite direction. Below is my Four Patch Plaid quilt from my first Nickel Quilt book. 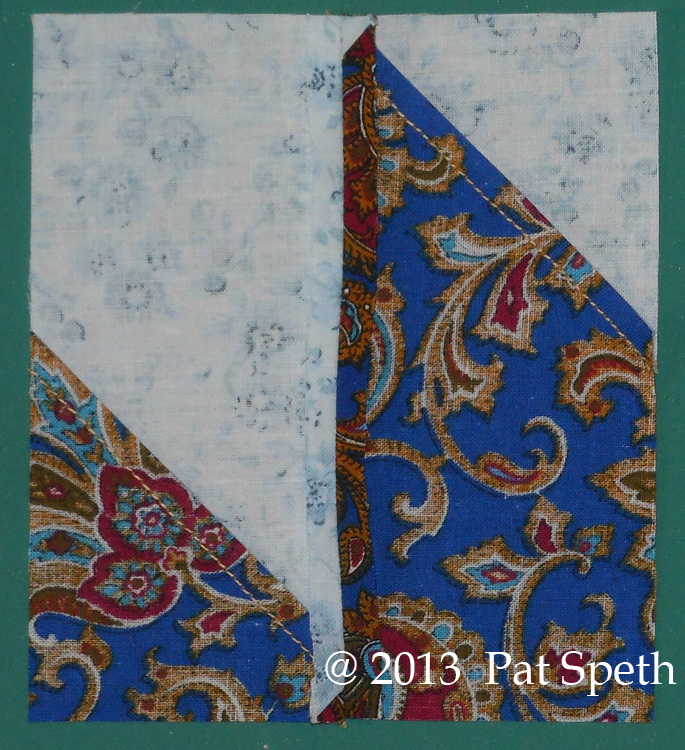 I am using the same picket fence pieced border, but now the border is pointing in towards the quilt. 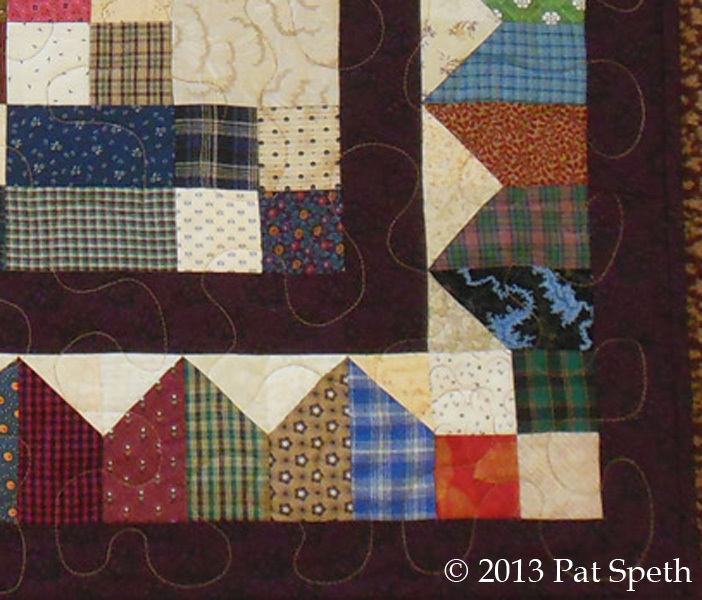 Close-up of the pieced border on Four Patch Plaid. 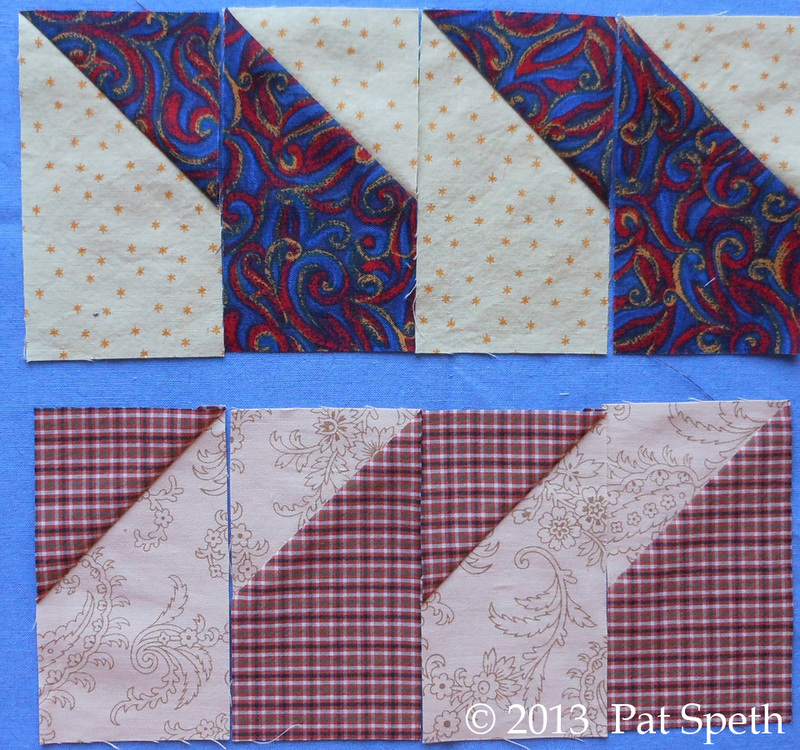 Now a closer look at how I turned the corners on the pieced borders. With Kansas Troubles I felt that a Three Patch unit with a dark square in the corner was the perfect way to turn the corners. 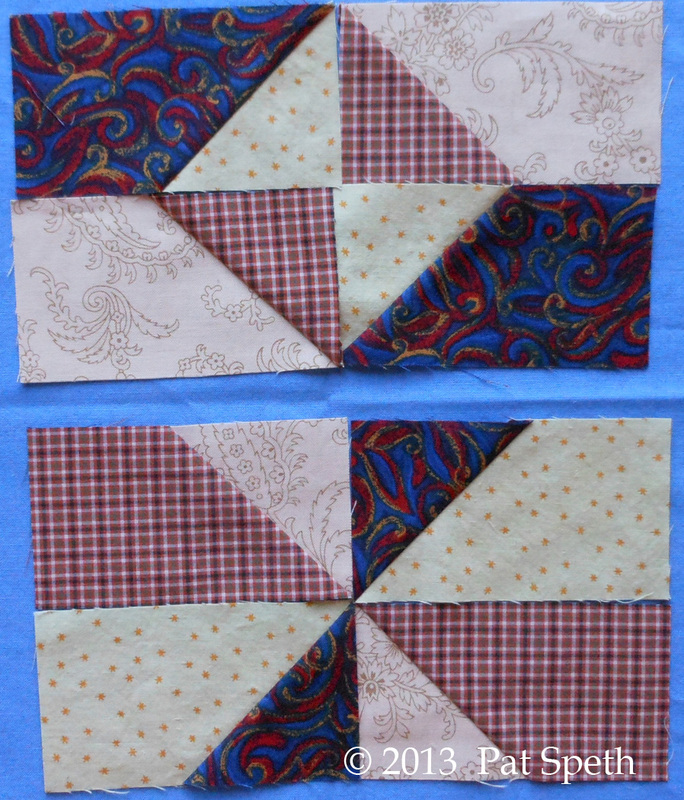 For Four Patch Plaid, even though I used the very same border, it’s just pointed in towards the quilt, I felt that turning the corner with a four patch was the perfect option. 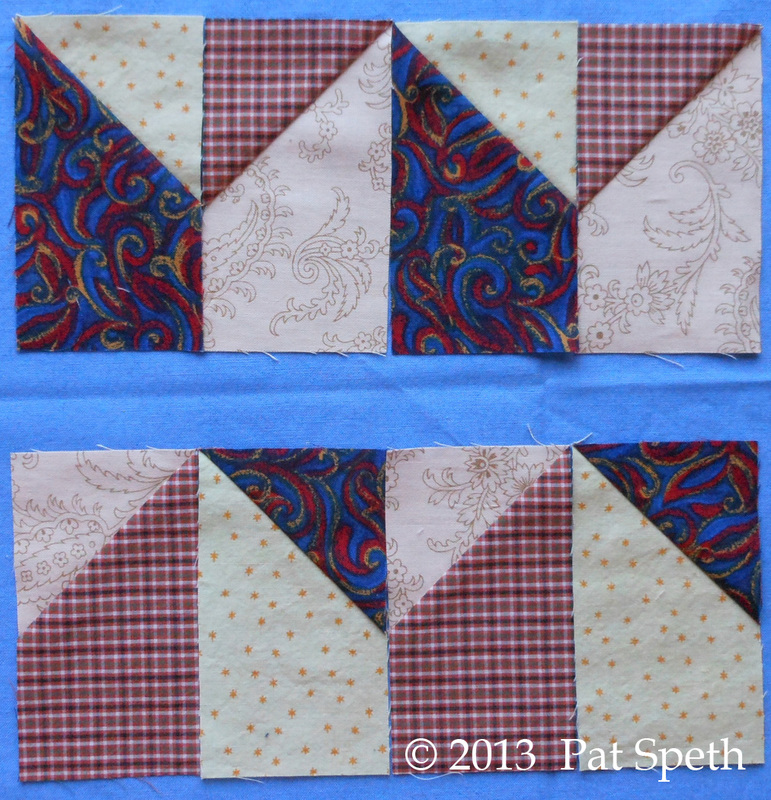 So try out different pieced border options and audition different units to turn those corners. And most of all, have fun! Taking advantage of the fact that I am using the same fabric for all the sashing pieces and inner border, I decided to piece together sections of the sashing fabric and cornerstone fabric. I will then cut it into strips; fast and efficient! Sew the pieces together with the 13″ x 12″ pieces on the outside. 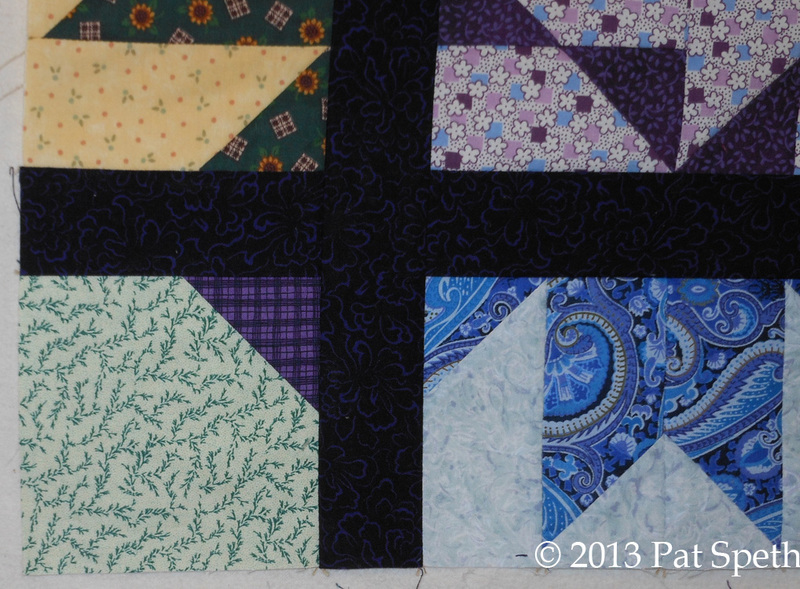 Cut this pieced section into 7 segments that are 1 1/2″ wide. 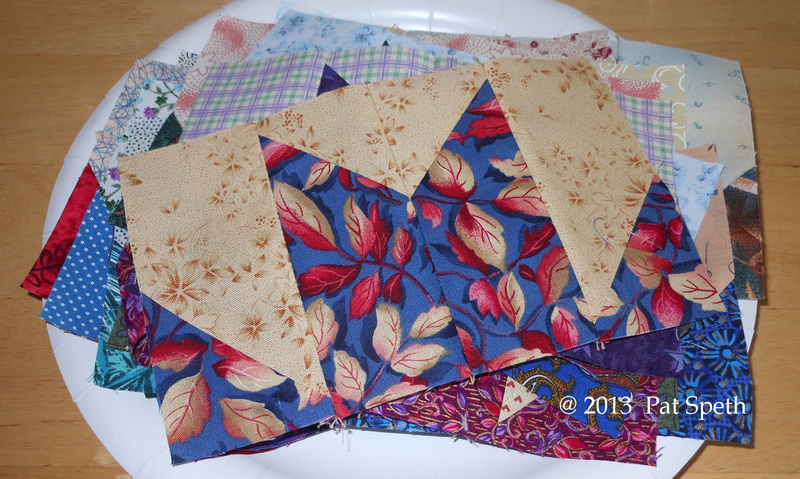 In the picture below I have folded the pieced section into thirds before cutting. 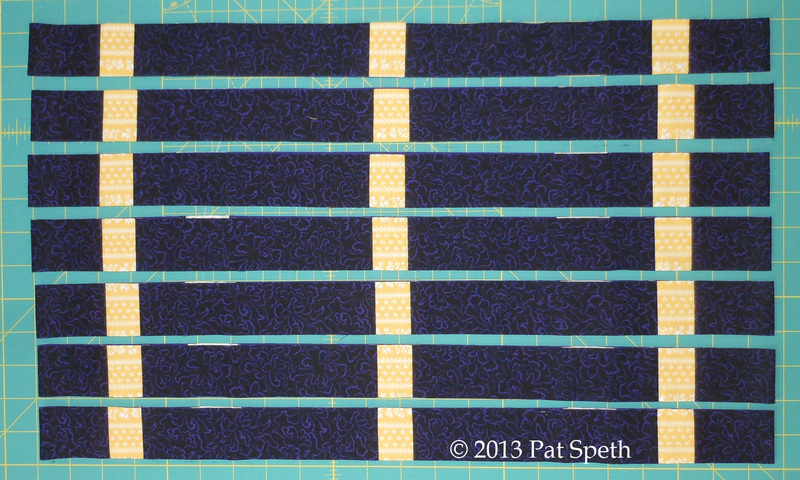 Now, sew these sashing rows between each of the block rows. 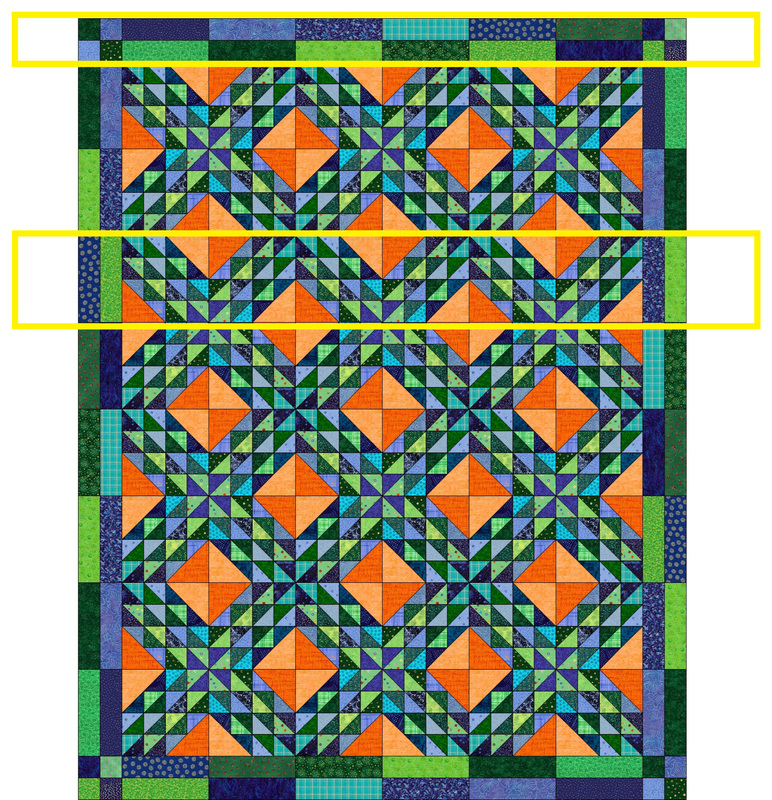 Add a 2″ wide inner border piece to the top and bottom pieced border rows. 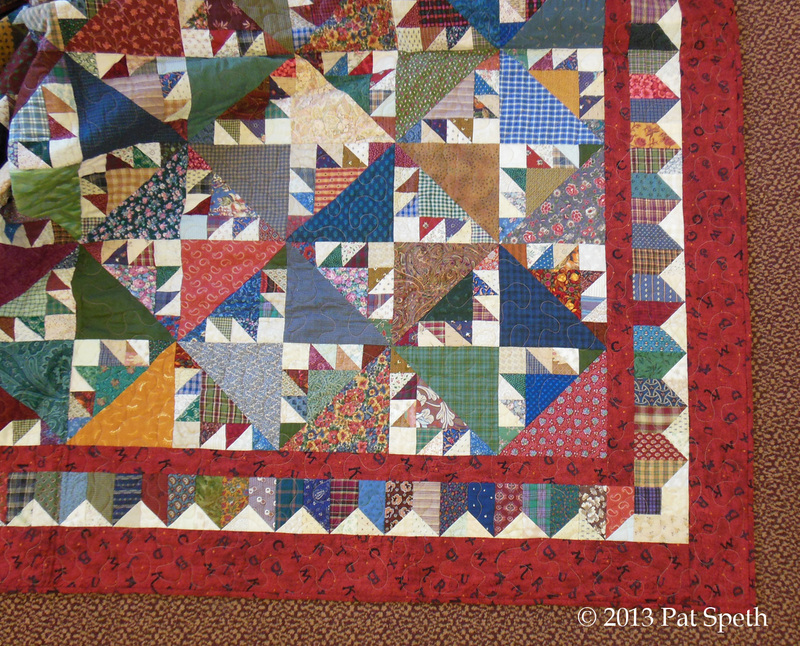 Sew the pieced border rows onto the top and bottom of the quilt and your quilt top is done! I love this quilt! And what’s really fun to realize is that most of the fabrics in this quilt are ten to twenty years old! 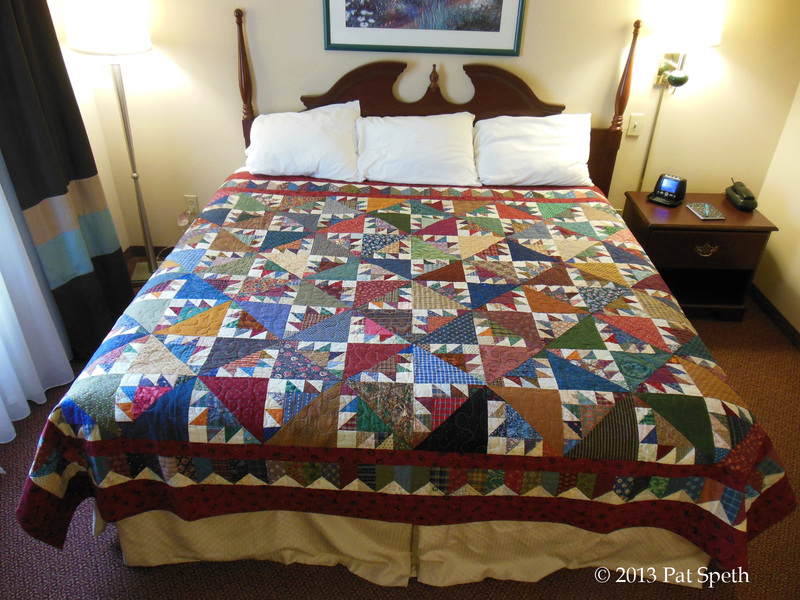 This quilt makes great use of those fabrics and I know many quilters have stashes like mine that span a few decades! I’m giving this to charity and I also think it would be a good charity quilt project for quilt guilds and individuals. This quilt measures 58 1/2″ x 74 1/2″, and because of how it is constructed if you want to make it in a different size it’s very easy to do. Now it’s time to load this on the machine and get it quilted! 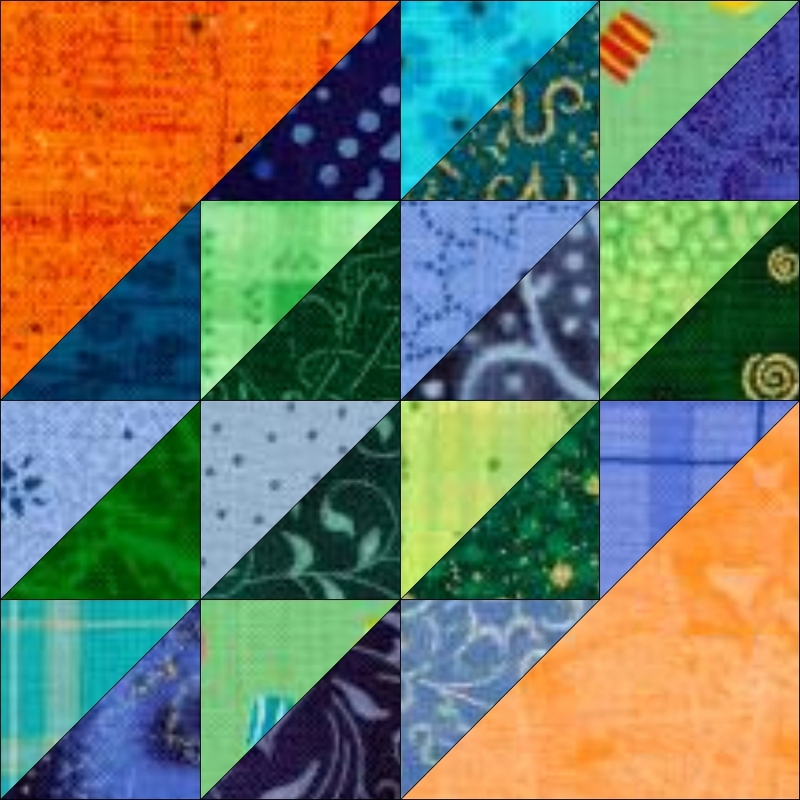 To find all the blog posts relating to the Turnabout quilt, simply type “Turnabout” in the search box that is located on the black bar near the top right of each blog page. If you belong to a quilt guild let your program chairperson know it’s time for a Nickel Quilt workshop where I teach many fun quilts and techniques! I used one fabric for the sashing, inner border and binding. If doing the same you will need 2 1/4 yards of fabric. For the block rows I simply added a 1 1/2″ x 7 1/2″ sashing piece between each block. I immediately put the block rows back up on the design wall to admire the view! Now I audition the placement of the border blocks. 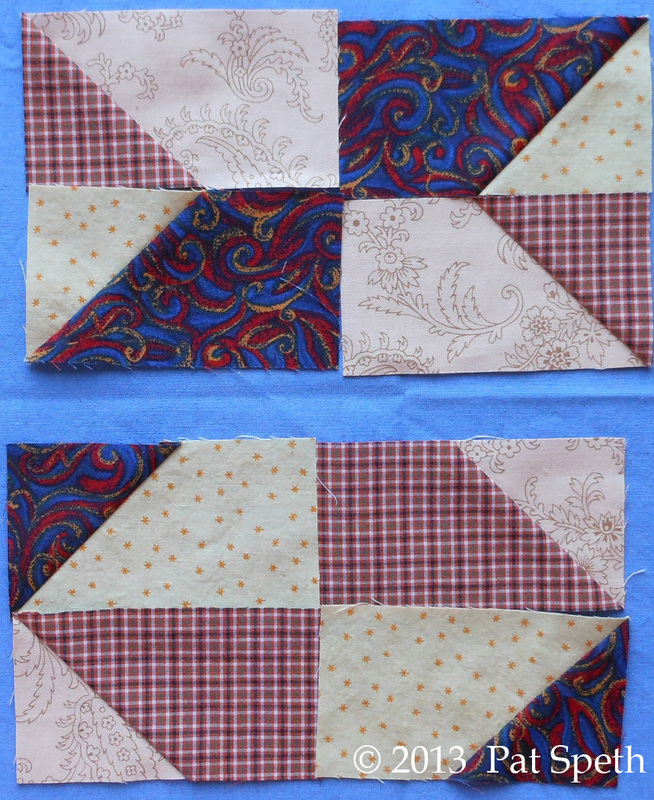 Next I sew the side border blocks onto the rows using an inner border piece that measures 2″ x 7 1/2″. 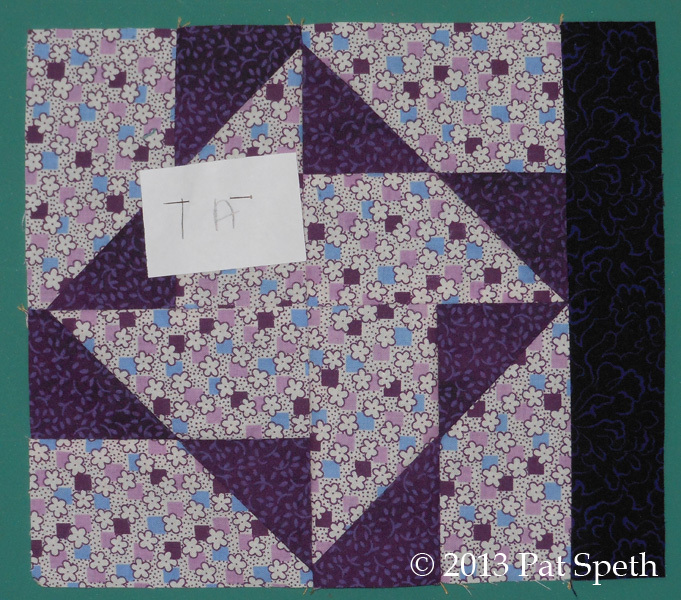 For the top and bottom border assembly I used sashing pieces between the border blocks that measure 1 1/2″ x 4 1/2″ and inner border pieces that measure 2″ x 4 1/2″ to join the corner units to the rows. The corner units are simply a 4 1/2″ squares with a 2 1/4″ connecting-corner added. Next I will prepare the sashing rows. 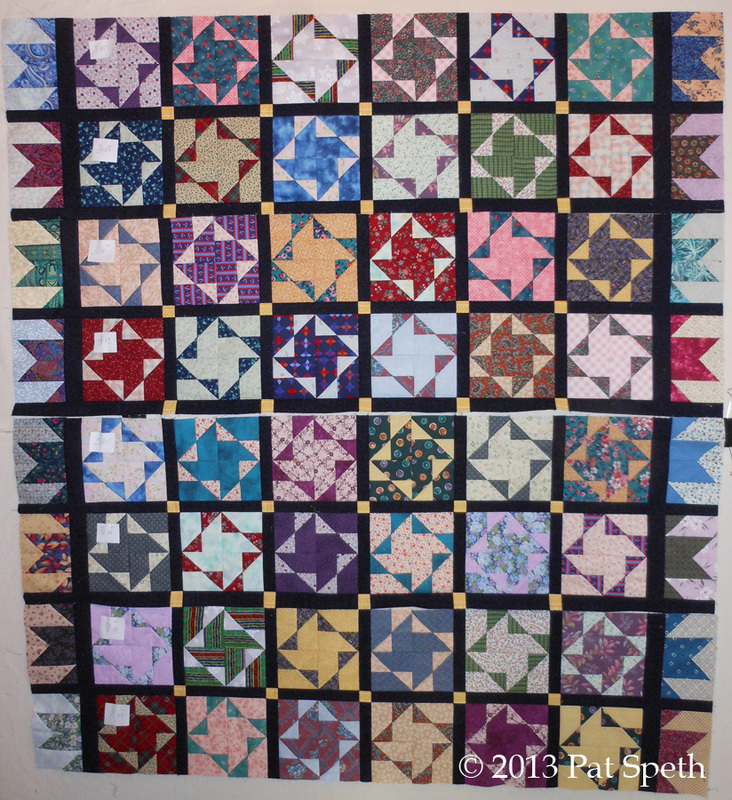 If you think this quilt and its pieced borders are fun your guild would love my Fabulous Nickel Borders lecture! To make these border blocks I started with Half-Square-Triangles that are squared up to 4 1/2″ and before sub-cutting I arranged them in this orientation. Measure over 2 1/4″ and cut each unit in half. Arrange the units as shown below and sew together. I pressed the seam in these units open to reduce the bulk. My border blocks are all done! 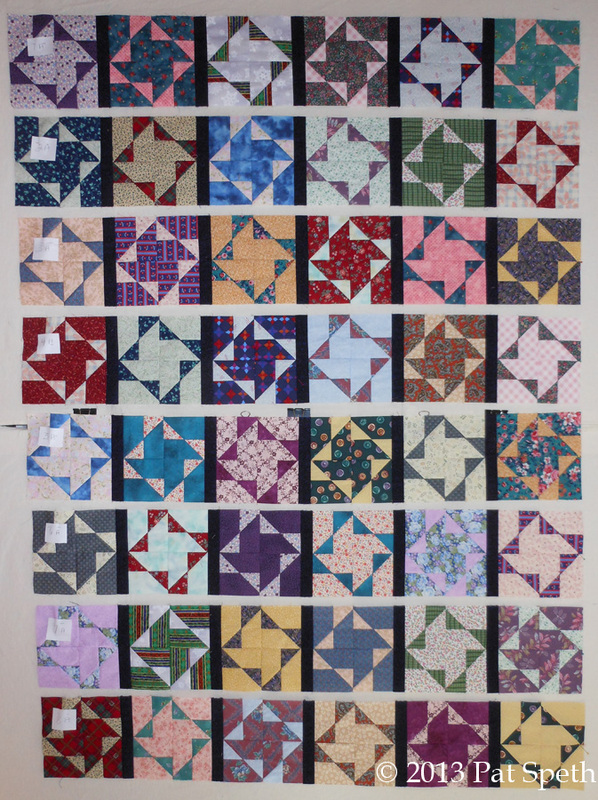 Turnabout blocks are done, border blocks are done, and now it’s time to get this quilt assembled! I think a pieced border might add something interesting to the Turnabout quilt so I’m going to play around with these picket fence units. 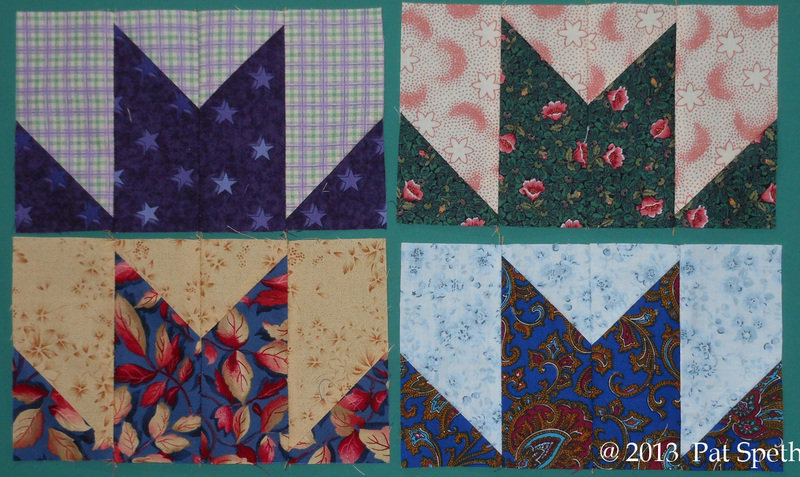 When I was making the block I only used the units on right of the picture below but for the border I am also going to use the units on the left of the picture. When positioning the half-square-triangle units in the above orientation before cutting you create mirror image units. Dark units that mirror each other and light units that mirror each other. Now I start playing with these units by setting them side by side, flipping, turning, and putting them in as many different arrangements as I can. All of the following ideas can be found in my Nickel Quilts & Borders book along with about 250 more great pieced border options! Isn’t this fun! 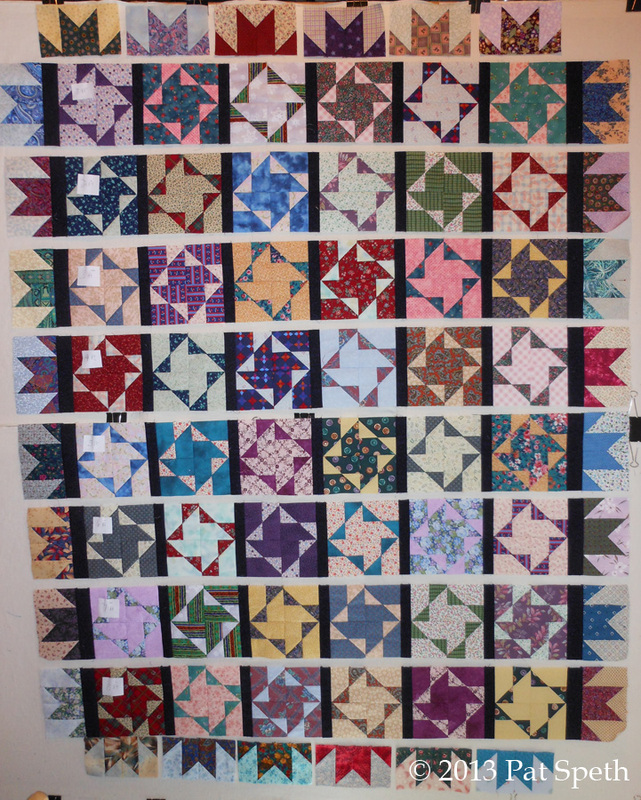 From just the few simple units shown above we are able to make all of these pieced border options plus many more. Now for the hard part, which one to choose for the quilt. I like to audition the borders so my next step will be to draw the quilt in EQ6 and try out some of the borders there. 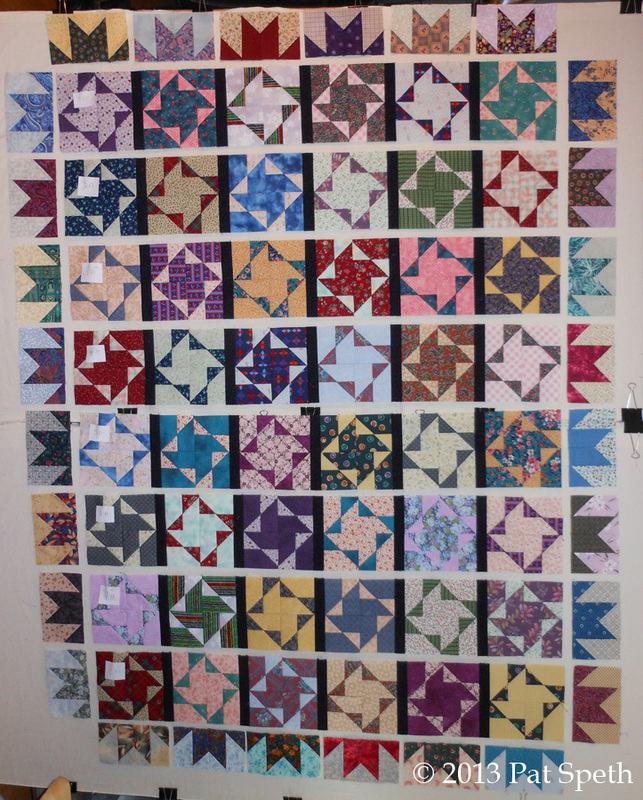 When I have narrowed down the choices I will go to the design wall with the quilt top and border pieces and try them out. 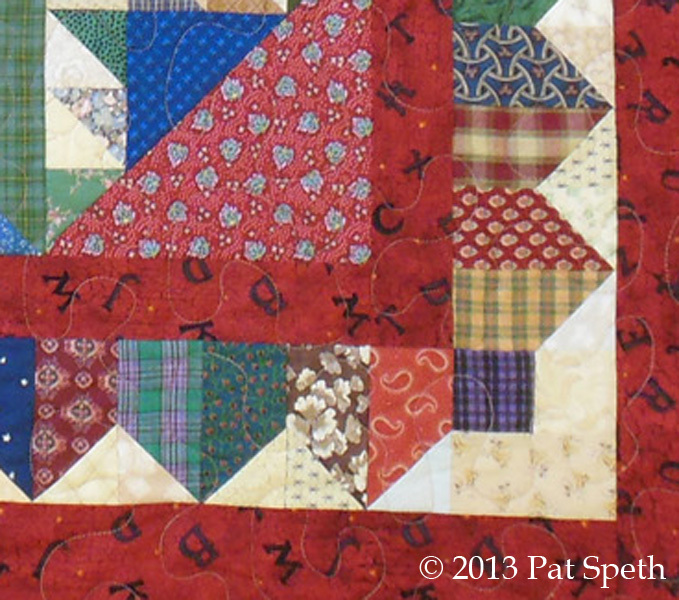 Now that I’ve given you some fun ideas for pieced borders try adding them to a quilt of your own!